St. Jude Medical, Inc. (NYSE:STJ), a global medical device company, announced today that it will have new data featured during late-breaking clinical trial presentations at the upcoming 2016 Transcatheter Cardiovascular Therapeutics educational meeting in Washington, D.C., October 29 - November 2. Throughout the congress, the company will also feature its latest cardiovascular innovations, including PressureWire™ X guidewire, the latest generation of the pioneering PressureWire guidewire system; structural heart solutions and the CardioMEMS™ HF System. Three late-breaking or first report investigation sessions and one oral abstract presentation will highlight data from St. Jude Medical advancements in vascular and structural heart technologies. The session: "ILUMIEN III (OPTIMIZE PCI): A Prospective, Randomized Trial of OCT-Guided vs. IVUS-Guided vs. Angio-Guided Stent Implantation in Patients with Coronary Artery Disease," will be presented by Dr. Ziad A. Ali, associate director of translational medicine at the Center for Interventional Vascular Therapy at Columbia University Medical Center in New York at 9 a.m. on Sunday, October 30. 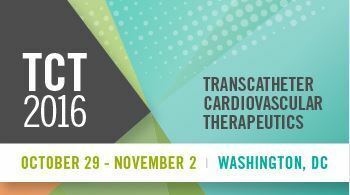 This is the first late-breaking clinical trial presentation of TCT 2016. The session: "RESPECT: Final Long-Term Outcomes from a Prospective, Randomized Trial of PFO Closure in Patients with Cryptogenic Stroke," will be presented by Dr. David Thaler, neurologist-in-chief at Tufts Medical Center and chairman of the Department of Neurology at Tufts University School of Medicine in Boston, at 12:15 p.m. on Tuesday, November 1. Previous results observed a stroke reduction across the totality of analyses with rates ranging from 51-73 percent. The session: "AMULET OBSERVATIONAL STUDY: Multicenter, Prospective, Registry Results with a Left Atrial Appendage Closure Device for Stroke Prevention in Patients with Atrial Fibrillation," will be presented by Dr. David Hildick-Smith, cardiologist at Brighton & Sussex University Hospitals in the UK, at 9:40 a.m. on Wednesday, November 2. Leading interventional cardiologists will also be on hand to demonstrate the OPTIS™ integrated system from 10-11 a.m. and from 2-3 p.m. each day during exhibit hours (Sunday, Oct. 30, Monday, October 31 and Tuesday, November 1). Additionally, on Sunday, October 31, St. Jude Medical is sponsoring a TCT satellite symposium, "Interventional management of complex patients, cutting edge technologies for the advanced interventionalist." For more information about this event, visit: http://www.crf.org/tct/agenda/satellite-programs.